Veterans Care Centers of Oregon (VCCO) is a 501(c)(3) founded in 2003 with the sole purpose of contracting with the Oregon Department of Veterans’ Affairs (ODVA) to operate the Oregon Veterans’ Home (OVH – The Dalles), and any nursing home that the Department might wish to construct in the future. Subsequent to its founding, VCCO modified its mission to include the ability to provide a broad-spectrum of services if the opportunity arises. In the summer of 2003, VCCO was successful in bidding on the operation of the OVH. Beginning on October 1, 2003, VCCO fulfilled that initial contract, along with two one-year extensions ending in September of 2008. When the ODVA issued a Request for Proposal (RFP) for the operation of the OVH in the summer of 2008, VCCO was once again successful in bidding, and has now been operating the OVH on behalf of the ODVA under the terms of this second contract since October 1, 2008. In 2013, the ODVA issued an RFP for the operation of a new Veterans’ home to be built in Lebanon, Oregon. After the conclusion of the bid process, VCCO was selected to operate this home on behalf of the Department as well. The OVH – Lebanon was opened in October of 2014, received Medicare and Medicaid certification in December of that year, and was granted recognition by the U.S. Department of Veterans Affairs in the spring of 2015. The VCCO board is comprised of veterans from various military branches, representatives from veteran’s service organizations, county representatives, healthcare professionals, and former staff of the Oregon Department of Veterans Affairs. All members are volunteers who have dedicated their time in order to honor those who have served. VCCO is committed to ensuring that veterans control the operations of the programs through policy and the direction of the board. VCCO believes that the success of this operational model can be seen in the fiscal health of the homes, the client satisfaction, and the recognition for providing quality care that it has received. In 2014, the OVH – The Dalles became the first state Veterans home in the nation to receive the American Health Care Association “Gold Quality Award”. This award mirrors the criteria of the Malcolm Baldridge National Quality Award. 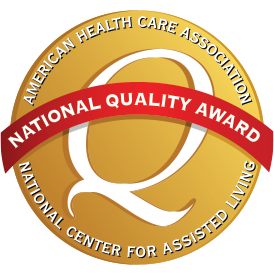 As of 2014 (the 18th year of the Gold Quality Awards’ existence), the Gold award had only been given to 24 of the nations’ 15,000 nursing homes.